Place pork in a large, heavy zip-lock plastic bag set in a shallow dish; set aside. For marinade, in a small bowl combine ketchup, soy sauce, brown sugar, wine (or lime juice), ginger and garlic. Remove 1 cup of the mixture to a small bowl; cover and chill until needed. Pour remaining mixture over pork; seal bag. Marinate in refrigerator for 4 to 24 hours, turning bag occasionally. FOR CHARCOAL GRILL, arrange coals around a drip pan. Test for medium-high heat above the pan. 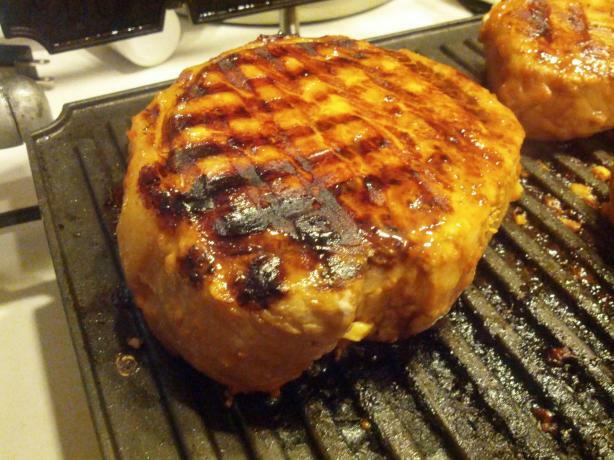 Place pork on grill rack over pan. Cover and grill 20 minutes. Brush with 1/4 cup of the reserved marinade. Cover and grill 15-20 minutes more or until an instant-read thermometer registeres 155°F when inserted into thickest part of the meat. FOR GAS GRILL, preheat grill. Reduce heat to medium-high. Adjust for indirect cooking, and grill as directed above. Remove pork from grill. Cover pork with foil and let stand 10 minutes before slicing. (The pork will rise another 5°F during standing.). Meanwhile, place reserved 3/4 cup of marinade in a small saucepan, and heat through. Pass the sauce with the pork. Garnish with lime wedges and sprigs of fresh herbs.